Whether it’s a long golfing weekend away with friends or a relaxing round of golf as part of a family holiday we have a range of policies that will cover both your golf clubs and other important aspects of a golf trip. 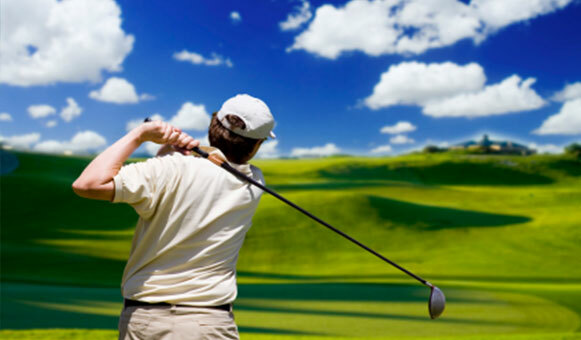 Playing golf as an activity is covered as standard on all of our travel insurance policies however an extra premium is required if you wish to insure against specific events. These extra elements include the loss or delay of your own golf clubs either in transit or from the club parking lot, club breakage if it occurs during a round, extra personal liability cover if you are unfortunate enough to smash the glass in the clubhouse window following a wayward approach to the 18th, the loss of prepaid green fees because of illness or injury and other items such as paying your bar in the unlikely event of a hole in one. Our approach has always been to offer the traveller the choice when it comes to golf insurance. Following a simple quote stage where we determine your needs, the policy golfing options are laid out on screen in such a way that you can easily see what is covered and more importantly whats not covered under each policy. Comprehensive golf travel insurance covers the policyholder for insurable events that may occur before or during travel, such as trip cancellation/interruption, medical expenses for injury or illness, theft of valuables, baggage damage and more. The cost of travel insurance is based on the type of cover requested, the age of the insured, the destination of travel, the length of stay, type of activities covered and whether you have any pre-existing medical conditions. We have a wide range of available travel insurance policies available to suit all needs. It is important to remember that the EHIC is for emergency hospital visits only and will not entitle you to any other form of treatment. It will also not cover the cost of emergency repatriation to the UK if needed and will not pay for any of the other benefits associated with a golf insurance policy including your baggage and golf clubs, cancellation, personal liability cover, etc. To find out more about the European Health Insurance Card, please click here.